It was a hot day in July of 2004. Natalie wasn’t working that day, and so she took the girls to the park. Hayden had turned six a couple of months earlier. Jordan was about to turn five, and Isabella was barely two years old. Hayden had been complaining of stomachaches for a while. Her parents had taken Hayden to the doctor, but the doctors couldn’t find anything wrong with her. At the park, when Natalie found unexplained bruises on Hayden’s legs and red patches on her chest, she became concerned. Natalie rushed Hayden to the doctor, where they drew blood. After receiving the results, Hayden’s pediatrician instructed Natalie to immediately take Hayden to Georgetown’s Pediatric Oncology and Hematology department, where she would be met by the head of the department, Dr. Aziza Shad. Hassan, Hayden’s dad, left work to meet them at the hospital. They had no idea what was going on. But they knew it was something serious. And the results of the next blood test confirmed the worst. Dr. Shad took Hayden’s parents into a waiting room and told them that Hayden had an aggressive form of Leukemia, Acute Myeloid Leukemia, or AML. The treatment, she explained, was intense. Hayden would need several months of chemotherapy. And due to the risk of infection, Hayden would need to stay in the hospital for most of this time. If the chemotherapy alone did not cure Hayden, she would likely need a bone marrow transplant. Hassan and Natalie were stunned. Their little girl had cancer. From that moment on, their lives would never be the same. But before she could even begin chemotherapy, her white blood cell count had to be reduced. As a result of her relatively rare form of Leukemia, she was suffering from a dangerous condition called leukostasis. A healthy person has about 2,000 to 3,000 white blood cells per μL of blood. Leukostasis is characterized by a white cell count of over 100,000/μL. When Hayden was admitted to Georgetown Hospital, her count was 220,000/μL. The treatment for leukostasis (which in itself has a very high mortality rate) is leukapheresis, a process where the patient’s blood is literally being taken out of her body, filtered, and replaced. Hayden spent several days in the Pediatric Intensive Care Unit (PICU) as the doctors worked to control her high white blood cell count. In the midst of this multi day process, Hayden was taken into surgery, where a central catheter line was installed into her neck so that blood and medication could be placed into her body more effectively than through the two IV lines she had in each of her arms. She also had a lumbar puncture to test for cancer in her spinal fluid and a bone marrow test. Hayden’s blood pressure dropped to dangerous levels, and she spiked dangerously high fevers. Her parents moved into the hospital, taking turns going home to be with Jordan and Isabella. The first few days were very frightening for Hayden’s family, as they waited impatiently for Hayden’s white blood cell count to lower enough to begin the chemotherapy. 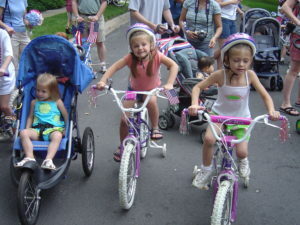 Many children do not survive leukostasis. One recent study showed the median overall survival of AML patients in leukostasis is 10 days, with 50% of the patients suffering an early death. Fortunately for Hayden, the process effectively lowered her white blood cell count low enough (70,000/μL) so that she could begin chemotherapy. The chemotherapy went very well for the first few days, with no significant side effects. On the seventh day of chemotherapy, Hayden spiked a fever of over 105 degrees and was put back into the PICU. After a couple of days of nausea and vomiting, Hayden recovered and was able to go back to her regular room. This room was an isolation unit, with hepa-filtration and an anteroom for visitors to wash their hands, and put on gloves, masks and gowns. After months of chemotherapy—all while in isolation—Hayden went into remission. This was great news, and her parents were hoping that she wouldn’t need a bone marrow transplant, which is the treatment of last resort for this type of cancer and many other terminal blood cancers. Unfortunately, in October of 2004, Hayden relapsed. Her chances for survival were very low. And her only hope was a stem cell transplant. But because of Hayden’s uncommon ethnic background (Iranian, Italian, and Anglo), there were no matches in the bone marrow registry. And none of her family members were a match. Hayden’s only chance for survival was a cord blood transplant—where the blood from a baby’s umbilical cord, rich with stem cells, is used instead of actual bone marrow. Such transplants were—and remain—highly risky procedures performed only by a few top medical centers in the country. Although Georgetown had an excellent pediatric oncology center, it was not equipped for such a transplant. Due to the intensive nature of a cord blood transplant, Hayden’s family would have to relocate for several months to be near the transplant center. Duke University in North Carolina was a natural choice for the Zavareei family. One of the leading transplanters in the world, Dr. Joanne Kurtzberg, had established one of the most successful cord blood transplant units at Duke. Natalie grew up about an hour and a half away, in Clinton, North Carolina. So Hayden had family close by. And Hassan graduated from Duke in 1990, and was familiar with the area and a proud Duke alum. To see a PBS news video featuring Hayden regarding Duke’s cord blood transplant process, click here. 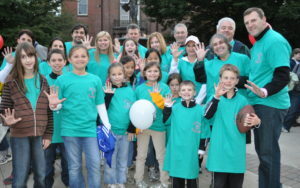 In November of 2004, the Zavareei family moved to Durham to begin Hayden’s transplant. First, she received an intense dose of chemotherapy. This was followed by total body irradiation. Hayden spent Thanksgiving morning receiving radiation treatment. The goal of these aggressive treatments was to completely destroy her current bone marrow—which was generating cancerous blood cells. Then, on December 1, 2004, Hayden received her transplant—an infusion of stem cells from an anonymous donor. Although it looked like every other bag of blood used for her countless blood transfusions, this one was special. If all went well, the stem cells would migrate to her bones and create an entirely new bone marrow. For the next month, Hayden and her loved ones waited and hoped for the best. Hayden was exhausted and slept for days on end. She could not eat because of sores in her mouth and constant stomach pain caused by the drugs that facilitate the transplant. Between long sleeps, she would pace the halls for exercise—with Natalie or Hassan following behind with her IV pole. 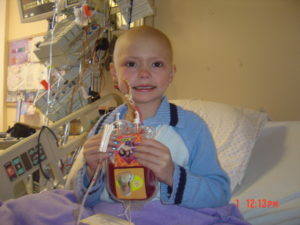 The motto for the transplant unit is “Grow Cells Grow!” And, finally, on January 5, 2005, Hayden’s stem cells engrafted. By no means was she out of the woods. She had no natural immune system, and a simple virus could be lethal. And graft versus host disease (where her body fights the new stem cells) could also be extremely dangerous. Hayden’s family witnessed the loss of many young children during transplant due to these complications. Fortunately, Hayden was one of the few children who escaped transplant without any serious infections or graft versus host disease. After over a month in the hospital, she was discharged to go “home,” which was the apartment her family had rented in Durham. Insurance paid for Hayden’s treatment, but it did not pay for the apartment that her family needed to rent in North Carolina or the expenses associated with maintaining two households. Natalie had to leave her job as a dentist to care for Hayden, and Hassan was working remotely in North Carolina. Their savings were depleted, and they were in need of help. Fundraisers by friends in Maryland and family in North Carolina provided the financial support that allowed them to pay for this separate home while living on one income. Over the next few months, Hayden continued to improve. Most critically, when Dr. Kurtzberg tested her blood, it was 100% donor cells. In other words, her old bone marrow was not making any more blood cells. But her new marrow was working away. And she was get healthier by the day. Finally, in May of 2005, Hayden was strong enough to go home. Her family began an exciting journey back to Maryland, only to be met by a frightening setback. Hayden became very sick on the drive home. She was nauseated, vomiting, and beginning to spike a fever. She couldn’t stand to be in the car any longer, but they were still over an hour away from home. They stopped along the way and found refuge at a local Mennonite church in rural Virginia. Fortunately, the pastor was there working on his sermon, and he took Hayden in and gave her an opportunity to rest and lay down while her family contacted her doctors at Georgetown. After she recovered a little, they took an unexpected detour back to Georgetown, where they were met by Dr. Shad. After Hayden was admitted, her blood pressure dropped dramatically, she spiked a fever of 107 degrees, and she was rushed into the PICU for blood transfusions and antibiotics. Finally, after a week at Georgetown, Hayden was able to return home again for good—after almost a year of living in hospitals and the Durham apartment. Hayden made a few more emergency trips back to Georgetown Hospital, but she emerged victorious each time. Over the next six years, Hayden continued to grow stronger and healthier. In 2006, Hayden was chosen as the Leukemia & Lymphoma Society Girl of the Year, and became very involved in raising funds for that wonderful organization. 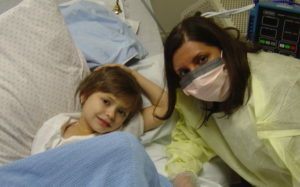 And she celebrated her five year transplant anniversary in December of 2009. After five years, Hayden was out of the woods. But she had not forgotten where she came from or the other children still in danger. Although she loved raising money for the Leukemia & Lymphoma Society, she want to directly help families who had to travel the same hard road that she did. So, shortly after her five year transplant anniversary, she invited her friends and family to a celebration to launch Hayden’s Journey of Inspiration. Since that time, HJI has steadily grown and now operates three beautiful renovated and fully furnished apartments in Durham. 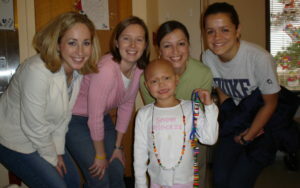 So far, over 30 families have lived in Hayden’s Homes while their children were transplanted at Duke. Hayden is now a thriving 19 year-old college student at Elon University—just a short drive away to Durham where she still sees Dr. Kurtzberg. She is majoring in Environmental Studies and is a member of vibrant sorority, whose motto is “Real Strong Women.” She is also still actively involved in HJI and its two big annual fundraisers—the 5K and 1 Mile Walk in Bethesda and the HJI Golf Tournament in Clinton, NC. FOR A CONTEMPORANEOUS ACCOUNT OF HAYDEN’S JOURNEY (including notes of support from friends and family), PLEASE VISIT HER CARING BRIDGE WEBSITE.